Album TD now includes an option to comment and aprove albums online. 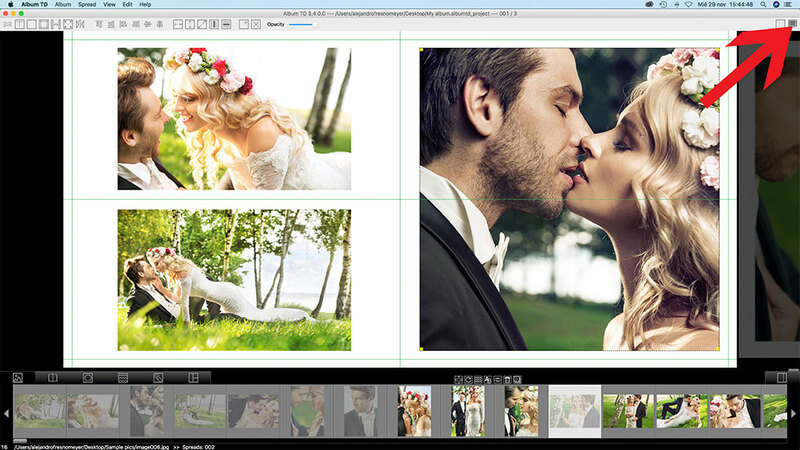 This new album proofing feature has a great advantage as it doesn’t requires the payment of any periodic or per use fees like most of the solutions available currently; also comments can be added using any device like a smartphone, tablet or computer. This system uses an awesome Google service available to anyone with an email registered at Google, not needed to be a Gmail account, only registered with Google. With this service users have access to Google Drive where they can upload up to 15GB for free and to Google Slides where Album TD will create the online album for proofing. Album TD Proofing will be for free for all licensed Album TD users as long as Google continues offering an application programming interface for this services in the same conditions which seems will happen in the future but I can’t guarantee it and also it is possible that updates must be implemented in Album TD for compatibility with new security and programming options. 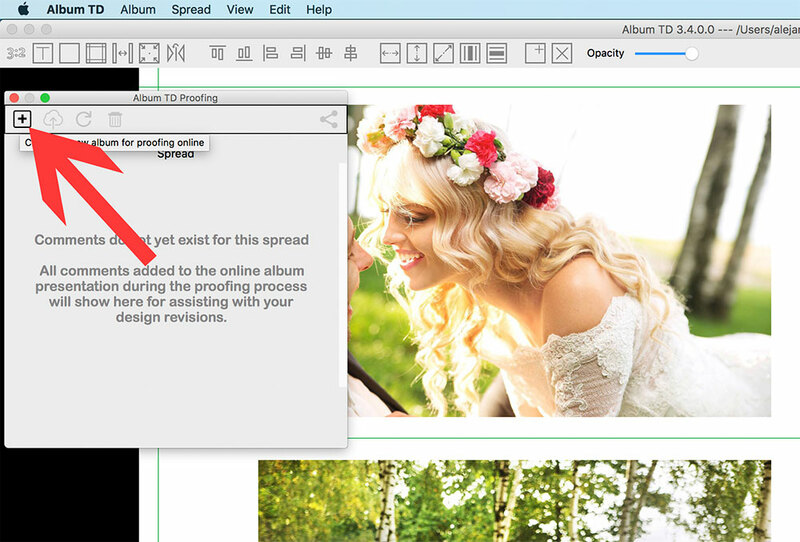 As I have no control about it this proofing feature is offered “as is” and not as part of Album TD license. With the 15GB available at your Google’s account you will have plenty of space for a lot of albums, older albums can be deleted at any time and in case you need more space Google offers it a very fair price. The proofing process is very simple. You will find a new comments icon at the main Album TD window, at top right. Once the album has been designed you will click at this icon and the application will open your default browser (Chrome, Safari, IE, Mozilla, etc) to connect with Google’s server. 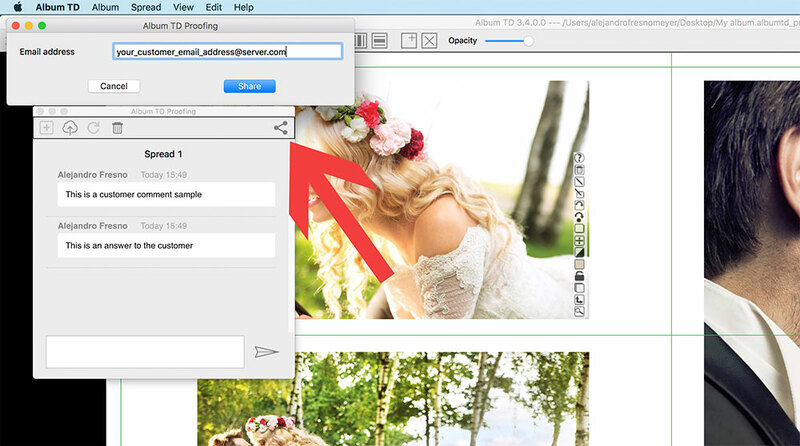 At the browser you will have to select the email account to be used, this is the photographer /Album TD user email and must be registered with Google. 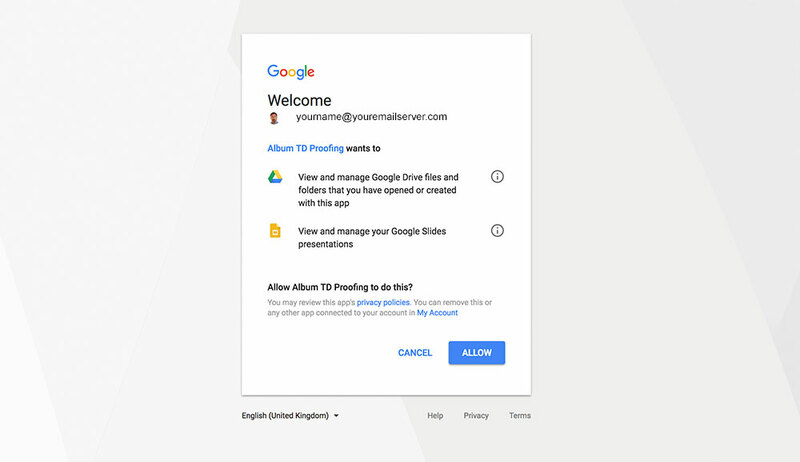 Then the browser will show you which permissions Album TD requests: access to the files at Google Drive created with the application and access to Google Slides to create the presentations online. 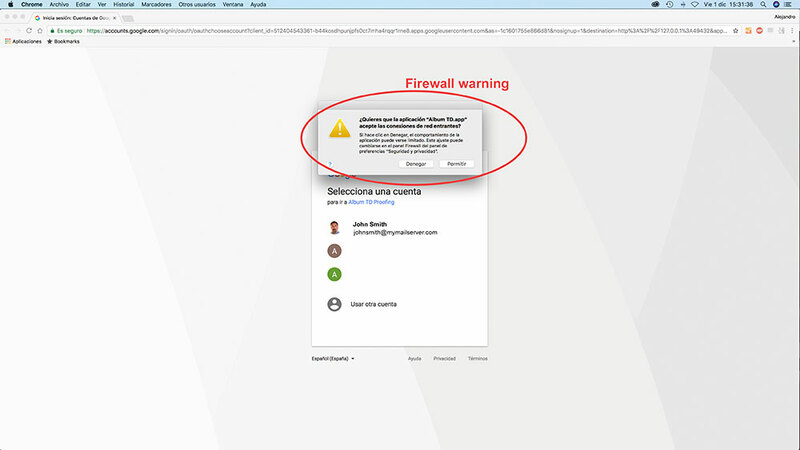 Most probably your computer firewall will request your authorization for allowing Album TD to receive the answer from your browser, please allow this step. Next time you use Album TD proofing options you won’t be prompted to login or select the account because Album TD saves the needed data to reconnect. Album TD has never access to your password or Google account, an OAuth2 connection is used which is the most secure for the user and recommended by Google (it’s the same used by thousands of apps when they request login with your Facebook or Google account). In case the application needs your authorization again you will be prompted for it at your browser. Permissions can be revoked at any time at your Google account. After allowing the access you will get the proofing window. The first action is to create a new album online by clicking at the + icon at top left. Then the second icon will be enabled and you may sync / upload the album spreads, by clicking at this icon the application will create the online slides. This process will take some time, a progress bar is shown at bottom. IMPORTANT: This window connects with your album online for each process and depending on the speed of your internet connection it may take some time, mainly while syncing the local and online album because a 30 spreads album needs uploading around 5MB of images and to create all slides. 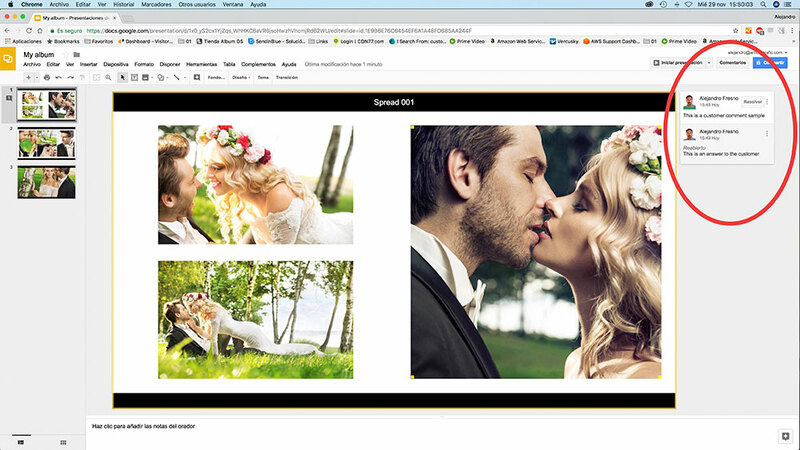 Now you already have an album online and you may share it with your customer and receive comments, we’ll use the sharing button at top right and after entering customers email you may click at the Share option. Your customer will receive an email from Google with your invitation and he / she only needs to follow the included link. 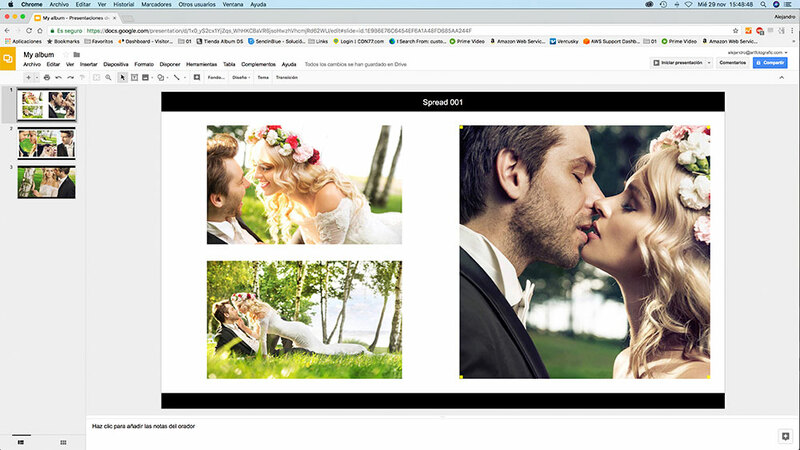 The album can be opened with any Internet browser or Google Slide apps for Android and iOs, it works in a similar way in all devices and your customer can’t edit the album but post comments or navigate through the spreads and start a slideshow. You will receive the comments in Album TD after opening the Proofing window, they can be updated by pressing the Refresh icon (please allow 10 minutes between each refresh). Album TD will show the comments for the current window, to see comments for other spreads please navigate through the album and select the spread. 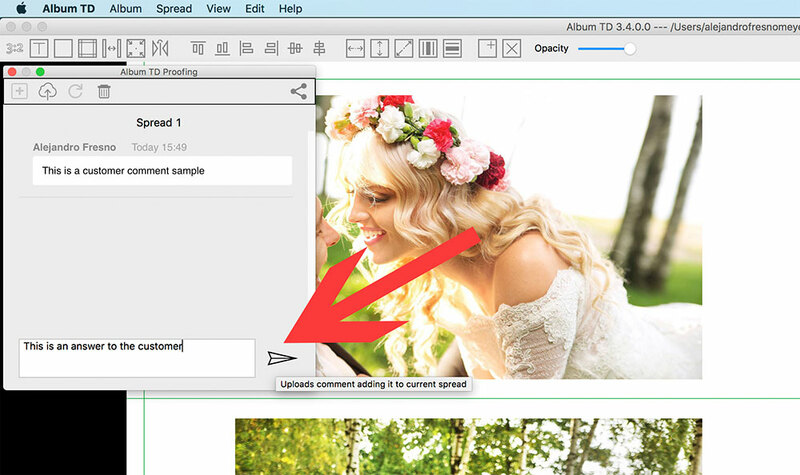 If a spread has a comment you may post your answer using the included option at bottom of the proofing window. Your customer will receive this answer at Google Slides. You may also use directly Google Slides to answer your customer in case Album TD is not available at this moment (with your smartphone, tablet or other computer); you only need to log in Google Slides using the same account as in Album TD. If your customer wants to share the album with a friend or relative he may use the option at Google Slides but you will receive the request and have to approve it because you are the owner of the online album. Comments show the author and date, hour if the comment has been placed the same day. To delete an album online you may use the trash option at the proofing window or directly at Google Drive / Slides but it is recommended to use Album TD to remove the link also from the local database. By deleting an album you will loose all comments. 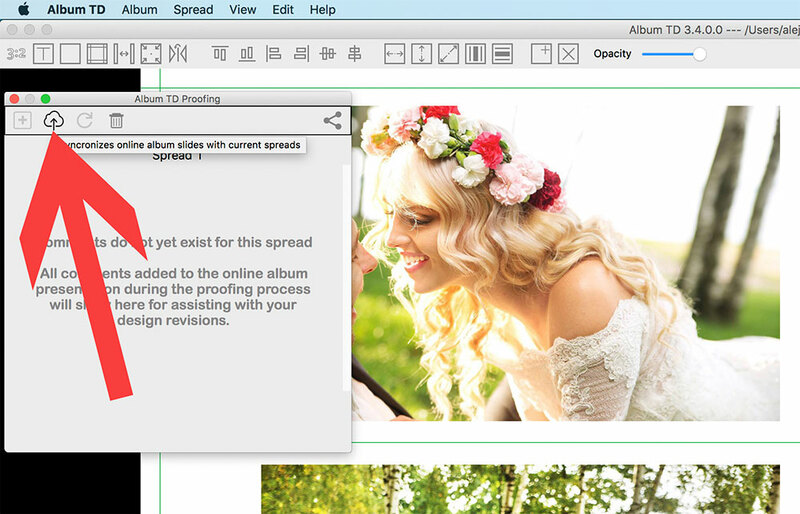 An online album can be synced with the local one at Album TD but not the opposite, therefore you must change the order, number of spreads and design locally and use the sync option to upload the new album spreads. Comments are owned by the spread where they were placed and not to the spread number, therefore after reordering the spreads comments will continue with the designed spread as expected even if the number changed. This may create some confusion at start, a comment is not for spread 1, 2, etc. it is for the design at the spread. 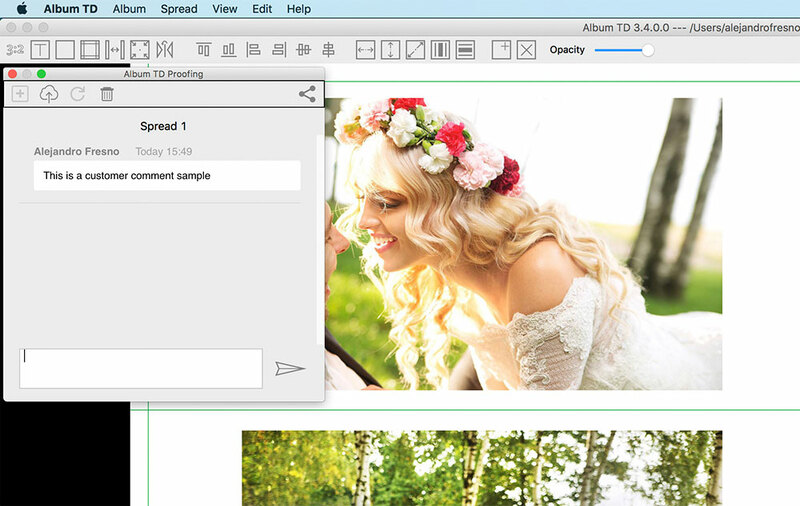 For now it is not possible to place a comment on a specific location / image of a spread, they are for the whole spread and while commenting your customer should reference the image if needed. In the trial version of Album TD the title of the online slides reflect the use of a trial version but functionality is not affected. Google Slides also includes an option to view the album in a slideshow and at the mobile / tactil apps you may navigate through the spreads using your fingers. It is available in many languages and it resizes content automatically for the device used. We hope you enjoy this new feature of Album TD. Google and Google’s logo are registered trademarks of Google Inc. Album TD Proofing is not authorized, endorsed or sponsored by Google Inc.
Google Drive and Google Slides are trademarks of Google Inc.